Acid phosphatase (AP) dephosphorylates phosphate groups from the phosphate esters in acid conditions. Different forms of acid phosphatase are found in different organs, and their serum levels are used as a diagnosis for disease in the corresponding organs. For example, elevated prostatic acid phosphatase levels may indicate the presence of prostate cancer and elevated tartrate resistant acid phosphatase levels may indicate the bone disease. 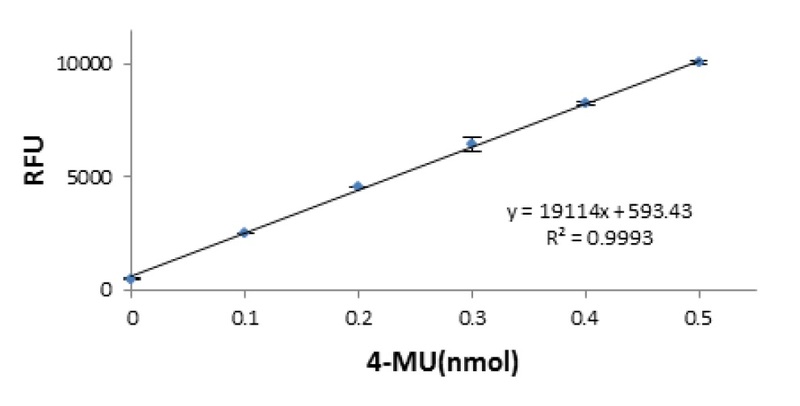 LSBio's Acid Phosphatase Fluorometric Assay Kit uses non-fluorescent Methylumbelliferyl phosphate disodium (MUP) as the substrate which has Ex/Em=360/440 nm when dephosphorylated by AP. The kit is an ultra-sensitive, simple, direct and HTS- ready fluorometric assay designed to measure AP activity in serum and other bio-samples. The detection sensitivity is ~1 µU, more sensitive than colorimetric assays. The kit is suitable for both research and drug discovery. This assay provides for the detection of Acid phosphatase (AP) in various biological sample types. Acid Phosphatase Activity Fluorometric Assay Kit standard curve.